We face two possible futures: either the default future we stumble into, or a created future we design and shape. We keep stumbling into a default future, the Guyanese nation. Were we to grasp the immense meaning of that simple idea, we would make a real effort to mend our ways. The future is inevitable, absolutely sure. It’s coming. But we don’t know what it holds. And because its arrival is so sure, so inevitable, we must project our minds and thoughts and intellectual effort there, way ahead, to plan, prepare and practise for the kind of future that works for us, the Guyanese nation. Planning for the future applies practically and wholly to the individual, and it applies to nations. Guyana’s potential, its latent energy, vast riches, astonishing dreamlike quality so wrapped up in its green forests, lush rivers and magnificent natural beauty of mountains, waterfalls and savannahs, captivated Mankind from ancient times. We today read of the fascination with which Sir Walter Ralegh encountered this land; we see the Demerara Gold brand of sugar now a global phenomenon; we know of the Guyana Dream to be the Breadbasket of the Caribbean, now very much a living reality; we know of the soaring accomplishments of the Guyanese people on the world stage; our writers, legal minds, beauty queens, singers mapping historical paths across the global village. News this week that Guyana got invited to attend a meeting of the BRICS countries, those newly emerging global powerhouses, comes as pleasant indication of what’s possible for us. The BRICS – Brazil, Russia, India, China and South Africa – are re-making the world order, with astonishing socio-economic revolutions, and Guyana sitting at the same table among them should stir our hearts with the magnificent beauty of what it means to be Guyanese. We see the Guyanese homeland suffer the devastating impact of the world record brain drain that has left us limping, wounded and unable to even carry on a decent public discourse. We cuss out, tackle each other in verbal irrationality and personal attacks, and refuse to indulge in the exploration of ideas, of mapping the kind of future that would work well for us. For 28 years we poured all our energy fighting for free and fair elections. We won that battle, optimistic and sure that after that we would build the future that we’re capable of constructing. Yet, two and quarter decades later, we still face a default future; we still fight and quarrel like little bedraggled children on a village dam; we still cannot make our Parliament work; we still harbour grotesque mediocrity in our national media; we still see poor governance across the society. Most telling, we fail to grasp the new age of the world, with its imperative of building Guyana into a Knowledge Society. To build the golden future, the El Dorado future, the Guyana Dream, we must engineer a new way of being. We cannot allow folks who wake up refusing to read classic literature, who stubbornly refuse to cultivate an educated imagination, to shape the national conversation. To build the kind of future that we’re capable of; that is embedded in our genetic makeup as the Guyanese nation, we must envision and create a National Vision to map a path that generates the future where Guyana is among the foremost Knowledge Society in the world. We’re capable of cultivating our minds, each individual Guyanese, so that instead of idly cussing out each other and picking isolated issues to complain about and scapegoat and blame others about, we roll up our sleeves to become solution-generators. The path to cultivating our minds is a simple one: we must re-engage the Guyanese Diaspora in the work of cultivating the Guyanese homeland into a society of knowledge workers. Understandably, local Guyanese view the Diaspora Guyanese community with fear and trepidation, because of the insecurity, distrust and subconscious inferiority complex inherent at home. In the same breath, most overseas Guyanese look down on home-based Guyanese, assuming an ignorant superiority complex. We’re all Guyanese, and we must join hands across the global village to make the Guyana Dream a living reality. One bright example, of the possibility inherent in the Diaspora, shows up in the fact that Guyanese at home who are visually impaired, and in fact all blind persons, could now look forward to a bright future, where they could attend University. 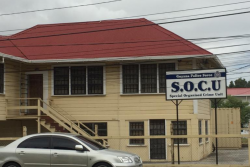 The Guyana Society for the Blind is now a transformed place, full of optimism, hope and vibrancy, engaged in creating a new future for its community. Just a couple years ago, talking to a blind person at the Blind Institute on High Street, Georgetown, saw pessimism about the future, and a degree of hopelessness. But one Diaspora Guyanese, Mr Raj Tribhuwan, came home and made a monumental difference. Through his Canadian Foundation, set up to transform how the visually impaired person builds his or her life, Tribhuwan caused a huge transformation in Guyana: today every blind person, every visually impaired individual, has the opportunity to become a knowledge worker, able to write subjects at the Caribbean Examinations Council (CXC), and attend University. We ignore success stories like this, as we enthusiastically claw our way into verbal mudfights, more willing to engage in verbal cuss outs than generate, discuss and cultivate a national arena where solutions spring forth to bud new gardens that grow a great Guyanese nation. We face all sorts of problems, ranging from governance to a myopic, poor national media landscape, one that demoralises the citizen, but if we focus on those problems, we would stumble into a default future where the problems perpetuate, ad infinitum, a la the democracy problem. Twenty-two years ago we were fighting for free and fair elections; today we fight for local government elections. We are stumbling into our default future, spinning senselessly to nowhere as a nation, caught in a vicious circle. We must see and feel the difference between our default future, and the future that we create, cultivate and inculcate into the heart and soul of every Guyanese citizen. The Guyanese future is for us to shape and design.